80 pages, 11" x 17". Grade 4 and beyond (DEPTH and BENEATH) and Grade 5 (SURFACE). First premiere February 16, 2011 by the University of Minnesota Symphonic Band, Jerry Luckhardt, conductor, Minneapolis, MN. Second premiere, February 23, 2011 by The Ohio State University Symphonic Wind Band, Milt Allen, conductor, Columbus, OH. The Minneapolis premiere of Immersion was recorded by Minnesota Public Radio for later broadcast. Click here to listen to each movement in its entirety. First premiere performance, recorded live at Ted Mann Hall in Minneapolis, MN. 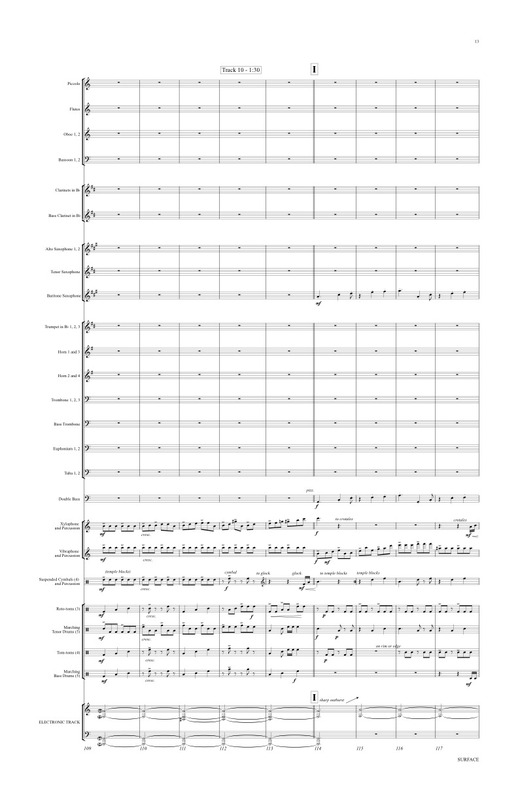 February 16, 2011 by Minnesota Public Radio, performed by the University of Minnesota Symphonic Band, Jerry Luckhardt, conductor. 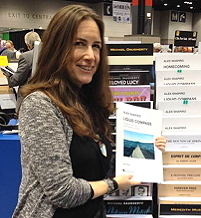 Score, parts and audio tracks are available as digital files. All three movements available from Activist Music for $350.00. Conductor scores: $60.00 for IMMERSION; $25.00 for any movement separately. Accompanying tracks include a conductor click track. 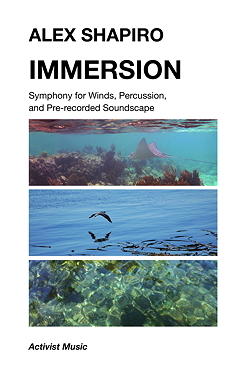 IMMERSION brings listeners on a sonic journey into a private, aquatic realm. Beneath the surface of the ocean is a world of liquid beauty and grace hidden from our eyes and from our imagination. Even in this habitat of life and hope, exquisite creatures remain vulnerable to events triggered from beyond their fragile sanctuary. Follow your ears and your heart to the depths of a place we sometimes forget to look. 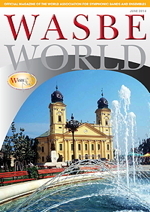 To download each movement separately, email Alex for the guest access code, then click below. Scores are for perusal only, NOT for performance. 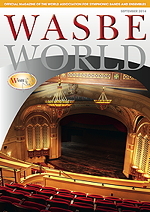 Premiere performance, recorded live at Ted Mann Hall in Minneapolis, MN., February 16, 2011 by Minnesota Public Radio, performed by the University of Minnesota Symphonic Band, Jerry Luckhardt, conductor. IMMERSION is a three-movement symphony that can be presented as one longer piece, or modularly, in any combination of movements together or separately. 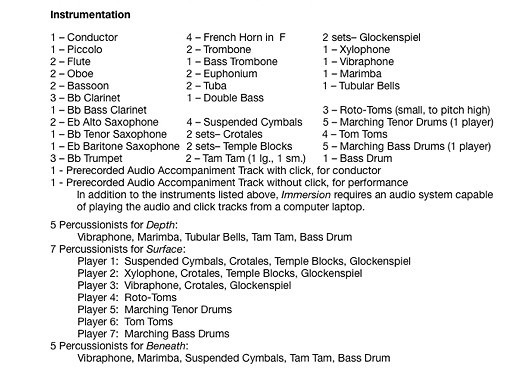 Depth, and Beneath, are moderate in tempo, while Surface is very fast and percussive, and even suitable as an encore. The sea has been a constant in my life, and I have always lived on or next to the water. From my upbringing by the rivers flanking Manhattan, to my earlier adult life on the Pacific ocean in Malibu and Santa Barbara, living on the beach and also on a sailboat, to my current existence on the Salish Sea in the Pacific Northwest where I can kayak from my home in the San Juan Islands to outlaying atolls, I’ve spent a lot of time observing water and water-based life. My studio on San Juan Island is in a largely glass house built on the very edge of the sea with an enormous view across the Salish Sea from the San Juans to the U.S. mainland, and as I composed Immersion, the ocean and its fascinating wildlife were my constant companions. Had I not been a musician, I might have become a marine biologist, and my interest in these sciences is reflected by my participation on the Advancement Board of University of Washington's Friday Harbor Laboratories, a preeminent marine science research center. I have a deeply fortunate life, to be a composer with an inner view to working scientists, and most of all, to have a window to the daily lives of wild creatures whose private existence is often beneath the surface, in the depth of the sea. I seek to share this private world, through music. Immersion would not have been possible without the endless support, enthusiasm and collaborative work of Jerry Luckhardt, whose vision and assistance are deeply appreciated. Want to hear how Alex found the perfect whale for this piece? Click here to read a short interview with her, on the blog The Natural World. 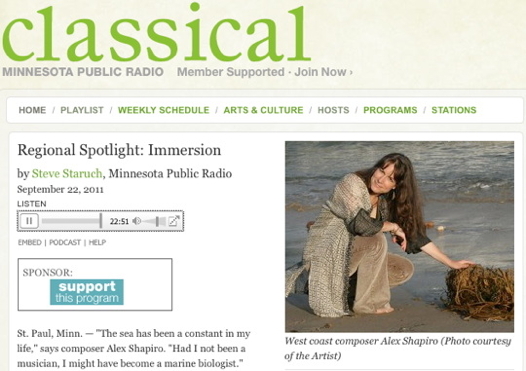 February 15, 2012: Alex was the in-studio guest on Marvin Rosen's new music radio show out of Princeton University, Classical Discoveries, during which they broadcast all of Immersion, and spoke about how the piece came into existence. 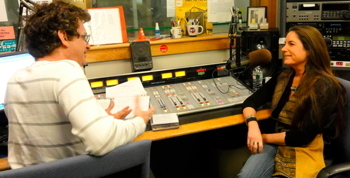 Alex chatting with host Marvin Rosen at WPRB-FM during her broadcast at Princeton University in New Jersey. 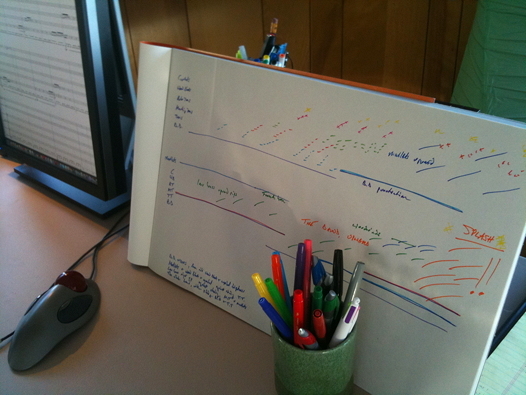 Where do composers get their inspiration? 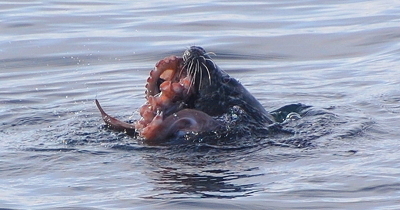 You can see more of Alex's photos, including the sequence of the life-and-death sea lion vs. octopus smack down as described by Alex in the Classical Discoveries interview, on this page of her blog, Notes from the Kelp. "There are less than a handful of [electroacoustic] pieces in the repertoire, and nothing like this one. Alex has a unique voice in music that I find stunningly beautiful and connected." - Jerry Luckhardt, Conductor, University of Minnesota Symphonic Band; 2011. 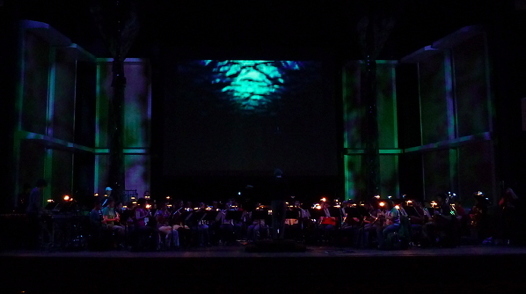 The video and lighting effects for the premiere of "Immersion" at University of Minnesota. 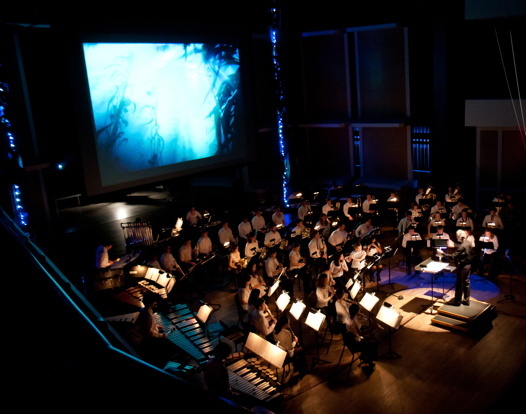 Enjoy videos of each movement of IMMERSION, performed by the Washington State University Wind Ensemble, conducted by Dahn Pham on a concert devoted to Shapiro's music during her residency as guest composer for the Festival of Contemporary Art Music on February 9, 2013. DEPTH: movement 1 of IMMERSION. SURFACE: movement 2 of IMMERSION. BENEATH: movement 3 of IMMERSION. 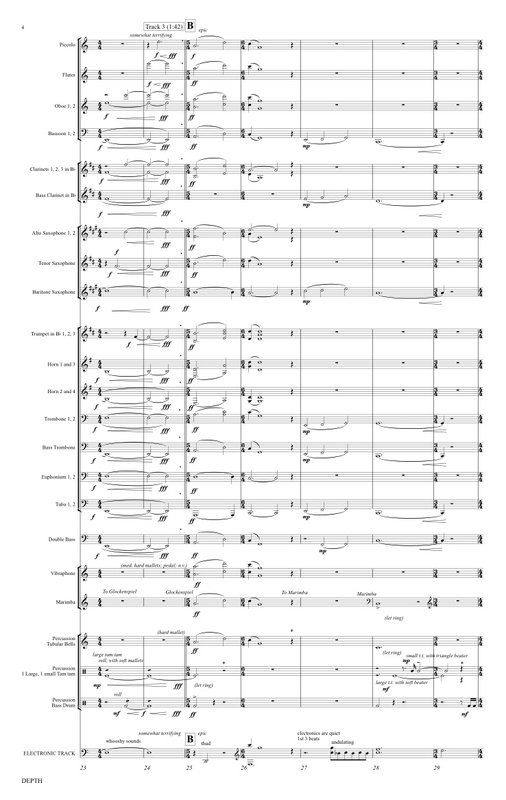 The University of Minnesota was the lead organization in a consortium of U.S. schools that commissioned Alex to compose this multi-movement electroacoustic symphonic band work. 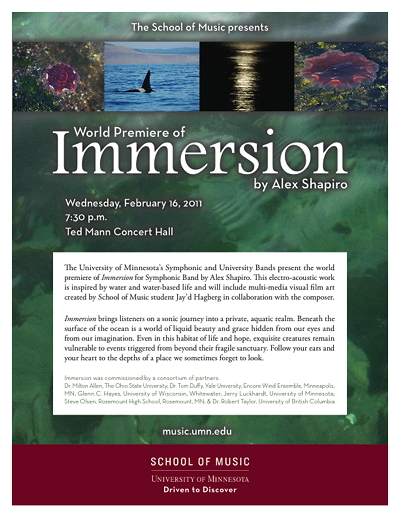 Immersion had its first premiere in Minneapolis, MN on February 16 2011, by the University of Minnesota Symphonic Band, Jerry Luckhardt, conductor. This premiere enjoyed a multimedia aspect as well, with video and lighting designed by Jay'd Hagberg. 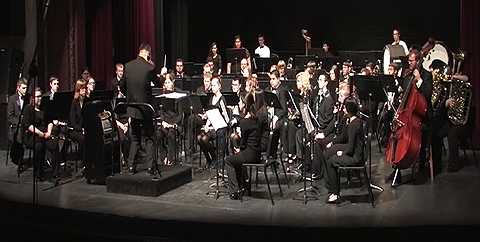 The second of the consortium premieres took place the following week on Feb. 23rd by the symphonic band at The Ohio State University, conducted by Milton Allen. 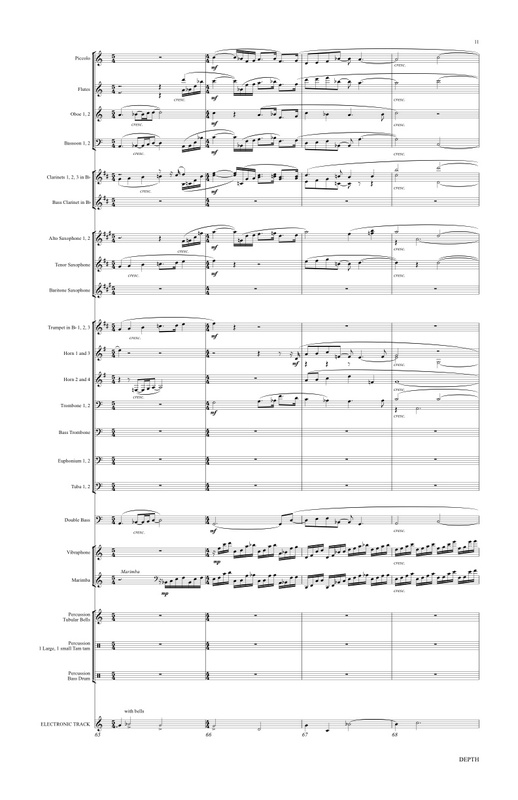 Click to enlarge these pages from the conductor score for DEPTH. 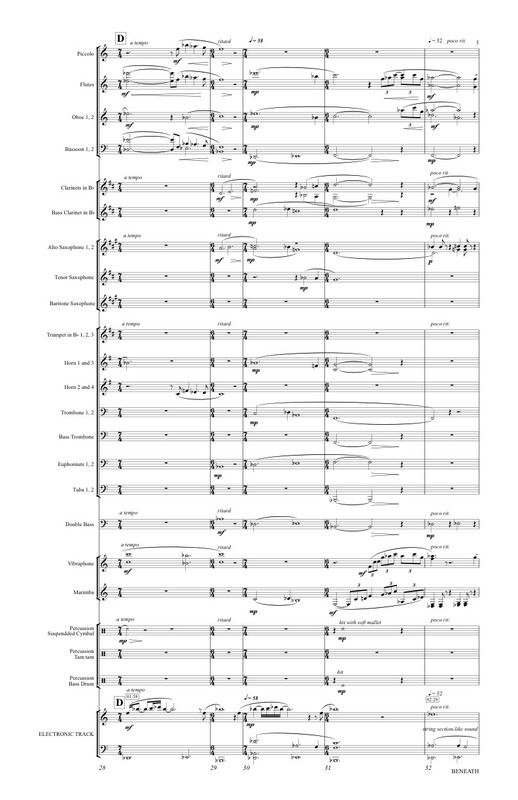 Click to enlarge these pages from the conductor score for SURFACE. 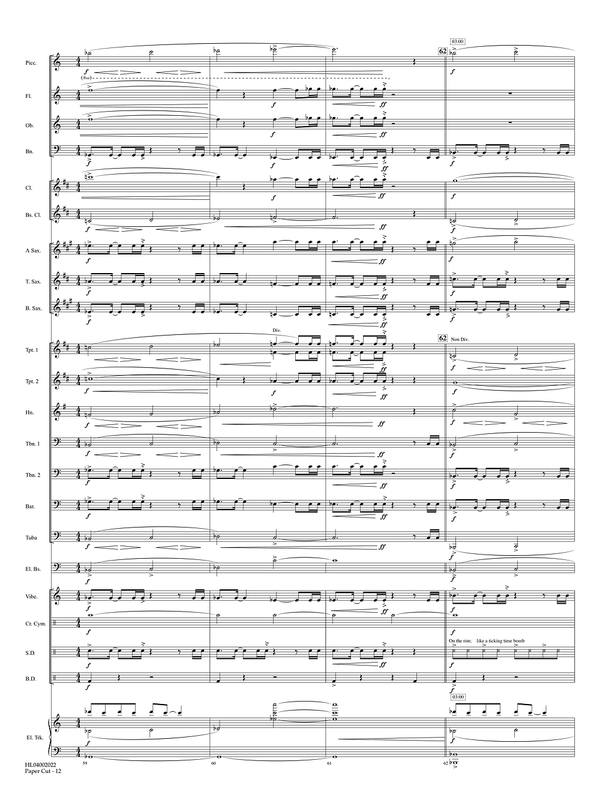 Click to enlarge these pages from the conductor score for BENEATH. 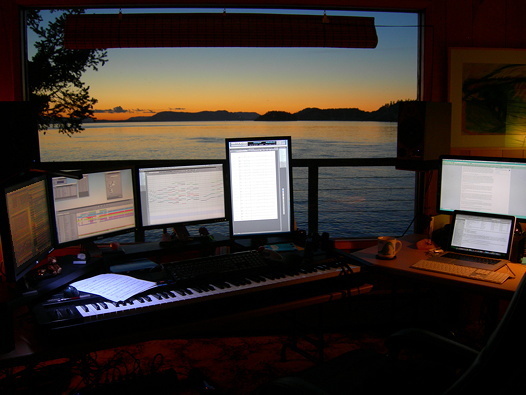 Alex Shapiro's studio, and her view while composing "Immersion." 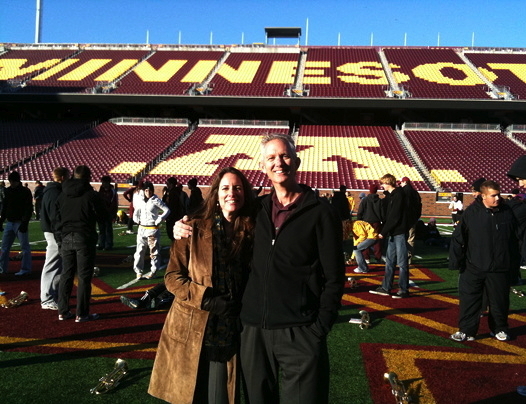 Alex Shapiro and conductor Jerry Luckhardt, on the University of Minnesota TCF Bank stadium football field during a marching band practice, October 2010. 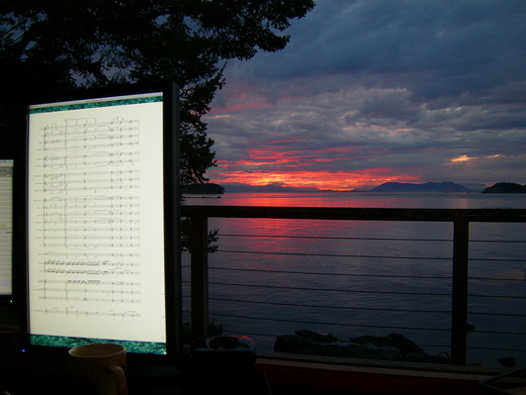 Alex Shapiro's initial sketch of "Immersion" second mov't, "Surface"
Sunset from the writing desk; Canada's Vancouver Island (L) and Salt Spring Island (R). The premiere of "Immersion" at University of Minnesota, Jerry Luckhardt, conducting. 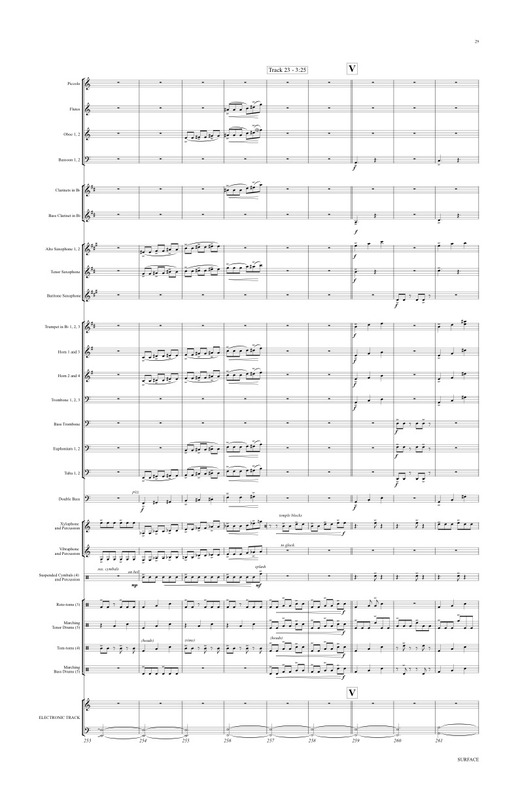 Click here to listen to the February 2017 podcast interview Alex did with host Anthony Lanmanon his show 1 Track, in which she A/B'ed identical sections of BELOW, for contrabass flute, and its subsequent version for symphonic band, BENEATH -- the final movement of IMMERSION.